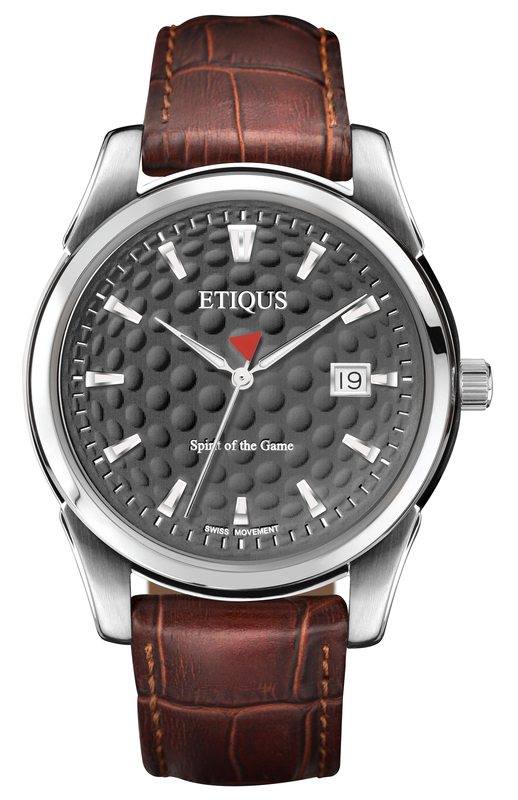 ETIQUS – a new British brand designing quality timepieces exclusively for golfers – has launched its debut collection which combines beautiful designs with Swiss made movements. The collection will initially consist of 24 timepieces with many subtle details and features that will be appreciated by golfers, from the unique dimple patterned face that gives the 3D effect of a golf ball, to a unique bezel that highlights your pace of play in line with R&A guidelines. The men’s range below (available now from www.etiqus.co.uk) will see prices start from £179, making them a great accessory option of gift idea. The brand name ETIQUS is derived from etiquette, golf’s written and unwritten rules of the game, while the brand is also set to donate £5 from each purchase to The Golf Foundation, which gives children and young people the opportunity to experience golf and the life skills it has to offer (www.golf-foundation.org). 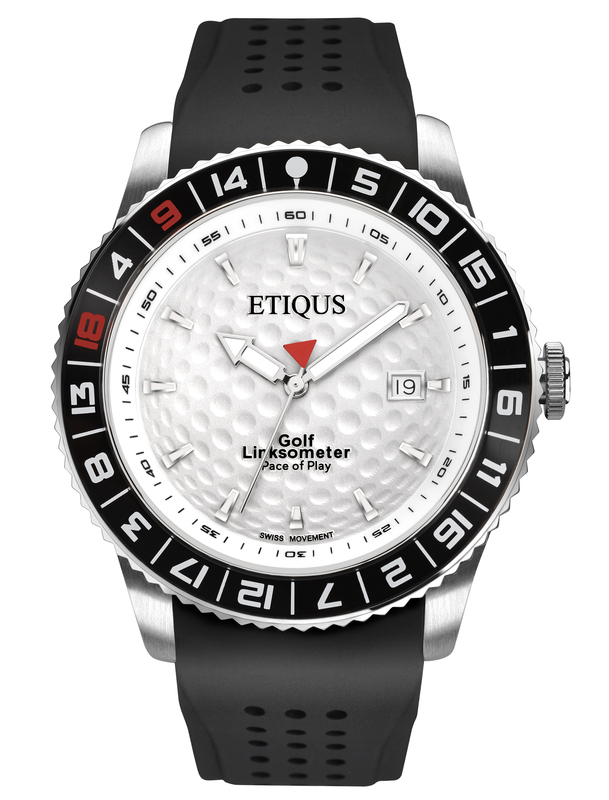 At 42.67mm, all of the ETIQUS dials are sized to match the diameter of a golf ball. A dimple pattern styled clock face gives the 3D effect of a ball, especially if you opt for the white colour option. The faces also feature a date window to remind you what date to write on your scorecard, and tees instead of numbers to represent the hours of the day. The second hand is a moving flag, a defining feature of every ETIQUS timepiece. All ETIQUS Sport watches feature an innovative ‘Butler Bezel’, inspired by the Pace of Play guidelines published by The R&A. This bezel allows you to track your pace of play over 18 holes against the guideline time of 3 hours and 50 minutes. The ‘Ball on Tee’ start marker, white boundary lines between numbers and the red numbers for 9 and 18 are all finishing touches that show you how you are progessing. One of the headline models, the Sport Pro offers six sporty designs, where each timepiece has the ‘Butler Bezel’, which gives an indication of your pace of play while on the golf course. There’s also the choice between stainless steel, silicone and leather straps, white or black dials, with prices from £269. For a trendy, stand out look try one of three watches in the Sport Iconic range. Each timepiece has the pace of play indicator, while a unique black ionic steel bracelet and choice between white, black or yellow dials complete the look. For a classic, sophisticated look there are eight products available in the Classic Tour range. You can opt for a stainless steel or leather strap (black or brown), and a choice between white, black or grey dials.